Could no hunting zone of the Idaho National Laboratory (INL) could prove haven for Idaho’s persecuted wolves? The vast (900 sq mil), sprawling INL has many nuclear reactors, but there is also a lot of open space where hunting and livestock grazing are not allowed. Therefore, it is hardly a surprise that some of Idaho’s fearsomely persecuted wolves have showed up right next to the relative safety of the fence at the Advanced Test Reactor Complex. There are elk to eat there too. This is not the first time wolves have been seen on the Plain near the INL in the area from Craters of the Moon National Monument (to the west) and northeastward to the top of the Snake River Plain and up into the Centennial Mountains on the Continental Divide. As Idaho continues with its wolf hunt and trapping that runs pretty much all year long, wolves have been appearing in places where they are more safe from the guns and traps. We have heard of several places, and they will remain nameless. This is important because Idaho Fish and Game’s war against wolves seems about to step up even more. They propose to divert coyote control monies into wolf killing. This is perhaps because the number of wolves killed in the Idaho hunt/trap so far this year is down, probably for several reasons, including lack of wolves. The ostensible reason for this direct wolf killing is to support the “Mule Deer Initiative” in Eastern Idaho. Mule deer numbers went into a long decline in portions of Eastern Idaho long before wolves ever showed up. Naturally predators got blamed anyway, at first coyotes and cougar. Blaming predators is easy and does not offend powerful politicians. However, not many wolves live in Eastern Idaho today. Nevertheless, wolves get blamed for what are perceived to be inadequate numbers of mule deer. For those interested in the trends of mule deer in Idaho and the causes of any population trends this report from Idaho Fish and Game might prove interesting. One conclusion that can be easily seen is that problems in Eastern Idaho are not due to the small wolf population there. See this report (pdf). Idaho Department of Fish and Game. Cal Groen, Director. Project W-170-R-34. Annual Report MULE DEER Study I, Job 2 July 1, 2009 to June 30, 2010. Thanks for keeping those several places “nameless”. As it should be. Isn’t it ironic and sad that some of the country’s “throw away lands” are becoming reluctant havens for some of our most persecuted wildlife? Reminds me of the increase in “radioactive” wolf populations found in the Chernobyl restricted zones. My comment dealt more with the misuse of other public lands. Most of our public lands are subjected various abuses from logging, mining, grazing, and development. My sadness is related to the resistance of land managers to having more of a preservationist mind-set rather than utilitarian. Joseph I was thinking the same thing. If its useless or in this case to humans then wildlife may inhabit. I fear that some will find a way to justify hunting in these “safe” places too. In my opinion, this facility should be decommisioned and converted into a national park. You do realize, of course, that INL is a research facility for nuclear power, and that if nukes (as undesirable as most of us think they are), are not used to generate some power presumably with increased safety, coal and oil power generation will increase, thereby resulting in greater CO2 production? Its interesting that there has never been any commercial electricity nuclear power ever generated on the INL or anywhere else in Idaho. Yea, that is important for those who aren’t from Idaho to know. These are all military reactors, not commercial power reactors, and Idaho has not a single commercial nuke. Interesting to note INL does have a history as a research facility for nuclear energy, including commerical application. And, let’s remember, the private companies that have run INL and Hanford (under long term contracts which turn over every 5-10 years) have been such companies as EG&G/URS, Westinghouse, Flour, Boeing, and Battelle, to name a few. Many Defense Department research and operation projects ultimately get fleshed out first there, then commercial application. Kind of like the Space program – where do you think Velcro, advanced ceramics (think shuttle tiles) and the like come from? A little more info on Idaho National Laboratory (one of 10 in the DOE system), and its leading role in nuclear research. I am decidedly pro nuke (power) for the most part, but understand most people’s hesitation due to past events. I think a lot of the nuclear tech will help get us through the 21st century and later…i.e. Best place for nukes is admittedly on another planet/in space. This is a trivial point, but what about Arco’s claim of being “the first city in the world to be lit by atomic power”? Interesting facts about Arco: its original name was “Root Hog.” And, it was named for Georg von Arco, a German inventor. And here I always thought it was named after Atlantic-Richfield Corporation. In a general sense I know what INL does, but since my conception of their activities was vague I briefly visited the website and was surprised at the diversity of projects. There is more there going on than I had realized. Nonetheless, I am not a fan of nuclear power. Even if atomic power could be made safe, we would create huge “sacrifice zones” to mine and extract all the uranium needed to provide fuel for seven billion people. Uranium mining, just as all other forms of mining, has a poor environmental track record. If proper environmental mitigation were to occur, I could support safe nuclear as a lesser evil than fossil fuels. As far as current safety, I am somewhat skeptical. I am sure our 23 boiling water reactors are better built than Fukishima, but we won’t really know until they are subjected to a major earthquake. In the meantime, taxpayers pay millions to move toxic uranium tailings away from environmentally sensitive areas. I will also pontificate (let’s see… “express oneself pompously or dogmatically”. Ouch.) that some “conservationists” will, like the proverbial horse, wear blinders and only see a narrow world view and remain oblivious to the world around them, content with the status quo and business as usual as the earth slowly sinks into an myopic abyss. In the end I don’t really care if research at INL is decommisioned or not; but I would support such a move. I am more interested in the roughly half-million acres of potential wildlife habitat. I also don’t care if it is a national park or monument or preserve or wildlife refuge or whatever. The habitat is key to species conservation. I feel just the opposite – there’s no way nuclear could ever work except in theory. In the real world, accidents, human error and greed, more demand, what to do with the waste, all make a terrible accident and long-term contamination pollution likely. It is irresponsible to build these plants, especially when you consider that world oil consumption is forecast to continue to rise, and the US is exporting it. C02 levels will not stablize or go decrease. All of these alternative energy sources bring their own challenges to the evironment, more than benefit. The only one I would support is rooftop solar for doing the least harm for the most benefit. ^^Edit: that should read “CO2 levels will not stabilize or decline. As an example, big pickups and SUVs outnumber Priuses by 50 to 1. (rough estimate) and that is just my small town. I drive a Prius; reduce, reuse and recycle like a madwoman, keep my thermostat at 60, am not engaged in the smartphone culture. But still, I don’t see anything improving, only continuing on the same course, at least in my lifetime. More than 1000 mule deer used to winter on the hills west of Moore, Idaho when I was in my teens. Two deer hunts were common in the Little lost River and Birch Creek Valleys at the time. Elk were re-introduced into the Lost River Mountains in the early 1950s from railroad cars full of elk captured in Yellowstone. As the elk began increase their numbers, the mule deer were starved out by the more aggressive and larger elk. The large stands of Mountain Mahogany throughout the Lost River Range were over-grazed and high-lined by the elk, putting the leaves out of the mule deer’s reach. There were no wolves in the area at the time. River dries up each summer due to the over appropriation of water by the farms and ranches upstream. There is however,a good supply of underground water that could be pumped to put water troughs through out the test site for Bison and Elk to use. Elk have used the area for winter range since the ice age ended. John Work mentions killing elk out of a large herd near the twin buttes on one of his Snake River trapping expeditions in the 1820s. Trapper Osborne Russell had encounters with wolves and large numbers of Bison there also. I am very familiar with the INEL test site and worked at the MTR/ETR/ATR area where the wolves were sighted,in the early 1960s as an X-ray tech and traveled the entire INEL site, x-raying pipe welds in the numerous nuclear reactors (30 or more)that used to operate there. My parents spent most of their adult lives working at the site. I used to get the maximum radiation exposure allowed at the time and though I don’t glow in the dark, I try to limit my exposure to medical x-rays. Some of the people I worked with developed cancer after working there for years. There are wells drilled throughout the the INL site (it has been called several names over the years) used to monitor ground water levels. Putting solar power pumps to establish water holes or troughs for wildlife using these wells would be a simple process. Thanks for the overview, Larry. I should add a couple things now that you have laid out a number of important details. The area which is now the huge Frank Church Wilderness is 2.4 million acres with no roads and it was a larger roadless area still in the 1930s and 40s. Must have been elk paradise? NO! A lot of folks bemoan the lack of elk there today and blame wolves. Idaho Fish and Game does. The elk are maybe from a couple per cent lower than their objectives (and a lot more in a few places). Back in the period before 1950 and even later, there were hardly any elk in south central Idaho. It was mule deer. A hundred years before that it was mostly deer and bighorn sheep. Entire tribes lived off the bighorn and the salmon. Hydro development nearly finished off the salmon and domestic sheep almost got all the bighorn. I think the historically new elk herds are naturally unstable populations in the big central Idaho area because they were introduced and they are still adjusting to conditions. More still, the conditions keep changing too. Probably a million acres of central Idaho burned last summer. Except for the big geologic features, central Idaho is almost unrecognizable to a person who hasn’t been there for 20-25 years. That is because so much of it has burned and the trees that haven’t yet are generally dead. Moreover, folks also don’t realize that central Idaho is underlain by the infertile Idaho Batholith. This is a vast intrusion of granite and related igneous rocks that break down into sandy and very poor soil. As a result bioproductivity is naturally low and Idaho Fish and Game probably overestimates the number of ungulates the area can support long term. Of course, let’s not forget that this new plan to use coyote killing money to kill wolves instead in Eastern Idaho is in fertile mountain lands, and also there are very few wolves to kill. Ralph your take on these issues is consistently invaluable and enlightening. And Larry thank you for your thoughts. It helps to understand the area and conditions. Depending on how over-appropriated the Little Lost is, maybe a purchase of senior water rights (who knows the cost?) under the in-stream flow program could make more surface water available through INL during critical times. Solar powered pumps on some of the shallower wells with good water and installation of guzzlers might also improve some habitat. Are those anything DOE/INL would entertain in the future, maybe to boost their image in the community (Idaho Falls)? As for the parts of your description of the atomic airplane program, there is alot of information available on the web. Don’t know about the contaminated well/equipment allegations, but wouldn’t be a bit surprised that is fairly common knowledge or readily available if one asked the right questions of DOE. So, once classified information or not, mentioning some of this fifty years after the fact, is not such a worry. Maybe it should be mentioned, and the clean-up problems addressed. That kind of stuff has plagued Hanford (and its huge and constantly postponed clean-up effort), with bad water migrating through the basalt to the Columbia River. I wouldn’t call Idaho’s deserts throwaway land and neither would anyone who has spent any time there. I would, however, call them one of our best kept secrets. You can wander around for days and see less people and more wildlife than I usually see when spending time in in so called wilderness. If the F&G can’t have a wolf hunt or trapping season on the INEL, I’ll bet they can call the euphemistically named “Wildlife Services” out to “control” them. What a sight – in hazmat gear to stop mutant wolves. There’s a B movie plot in there somewhere. This land is not useless . It has been used by humans for thousands of years. 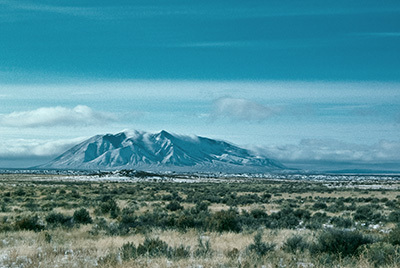 Some of Idaho’s oldest known occupied sites occur on or near the INL . Topher badly phrased on my part. I meant deemed useless by humans! About twenty years ago, a local Lost River Phd. (Absent minded professor type) negligently pulled a trailer with one of its’ tires on fire from Howe to the Howe junction east of Arco before someone pulled him over. He started a very large range fire. The area that burned is one of the best looking grasslands in Idaho today. It would support a fair sized herd of Bison. Elk regularly come off of the mountains to the west and graze there. Surface to ground water depths on the INL vary from about 200′ near Terreton to close to 1000′ out near the Big Butte. I had a summer job that required me to measure the depth to water in numerous wells on the INL site on a monthly schedule and to take water samples for radiation content while in college. Wells I sampled in the Central Facilities area were contaminated with Tritium from radioactive waste injection wells from the Chem Plant to the north. The radioactive plume of Tritium contamination covered a large area near the Chem Plant and areas south past Central Facilities at the time. Plant managers when the INL (AEC) site first got started should have been jailed for criminal negligence.They were very careless with radioactive waste. Contaminated equipment and clothing was just buried in dirt trenches. I suspect a lot of it is still there. All over the world you find wildlife in places where human access is restricted. It’s not just Chernobyl; the demilitarized zone between the Koreas, military bases across the American south and west is havens for the Asian Stork, Red Cockaded woodpecker, indigo snake, gopher tortoise and desert pronghorn. There are many other examples. More examples of wildlife at US federal facilities: Gators and whatever they like to eat at Kennedy Space Center; deer at the Air Force Acadamy, and the Oakridge, TN National Lab; elk at Hanford, and salmon in the Hanford reach of the Columbia; ducks, mule deer, and bison for a short while, at Rocky Mountain Arsenal east of Denver (once a military chemical warfare facility now a USFWS National Wildlife refuge). There have been habitat improvement as well as population control efforts (yes, hunting) at each one of these locations, if I recall correctly. WM, Good examples. Additionaly, the USFWS now owns Rocky Flats, a former nuclear weapons production plant. A study conducted in 2012 found that the soil in the area is as contaminated with plutonium now as it was 40 years ago. Yes,I forgot about Rocky Flats. One of my professors was studying peregrine falcons there about 35 years ago. I moved to Colorado about two years later, and accidentally crossed paths with him in a King Soopers grocery store. What a surprise for both of us, right there in the dairy aisle – animated discussion about radioactive isotope exposure effects on raptors, to the amazement of passing shoppers, reaching for a pint of cottage cheese. By the way, I recalled (possibly incorrectly) you were in Louisville. The Blue Parrot still serving decent Italian food? Dont know how long its been since you were in this neck of the woods, but things have really changed. Lots of development or as my kids call it “destruction”. And yet the highest densities of white-tailed deer ever recorded occurred in an urban area; and coyotes thrive in downtown Chicago and LA. Perhaps the difference is that animals are simply much more visible where they are protected from human sources of mortality? A few thoughts: Livestock grazing is allowed on approx 60% of the INL, or whatever they’re calling it these days. A well known local sheep rancher in the area once told me a person could go about anywhere out there in spite of all the security restrictions if you have a band of sheep to follow and you could even have a rifle (to protect the woolies from the dreaded coyote). I’ve harbored a bison dream for many years which would have a free ranging, brucellosis free population summering in Birch Creek and wintering on what is mostly INL.There is relatively little private land in the Birch Creek drainage and if I hit the Powerball I’ll buy it up and implement my dream! With no livestock competition I’m thinking you could have 1000 to 1500 bison there on a sustainable basis. Not meaning to pour water on your campfire, but on a practical matter, do you think you could convince the permit holders to give up their cattle and sheep permits; and if they did, would the BLM re-issue them to you to run Bison ? I’m sure you would have to buy out the livestock permittees preferably through purchasing their base properties – not that many in Birch Creek. BLM should not require grazing permits for re-introduction of a native species, however if needed, particularly in the beginning, I believe there is precedent from the next drainage east, Medicine Lodge, where a rancher did run bison on his cow permit recently. Not really a direct comment on the subject but it is very refreshing to read through all of your responses regardless of your take or opinions and see that all of you converse professionally without nasty language, back-stabbing, etc. I am so tired of reading responses on blogs and the like from individuals filled with vile language and the like. I look forward to reading more via this site/blog.